On August 24, 2015, City Council adopted principles and strategies for financial strength and stability. This is the goal. 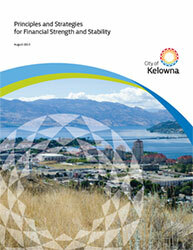 The principles and strategies set out in this document will guide decision-making within the City and help to realize this goal and, ultimately, the vision for Kelowna. These principles serve as a basis against which the financial strategies that are outlined in the documents can be tested, reviewed and updated as needed. For more information, review the Financial principles and strategies document and summary one-pager.